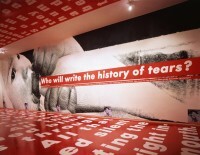 Barbara Kruger was born in Newark, New Jersey in 1945. She attended Syracuse University and Parsons School of Design, and following graduation, obtained a design job at Condé Nast Publications. 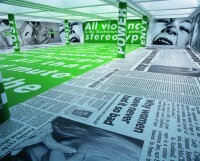 Kruger's background in design factors into her art practice. 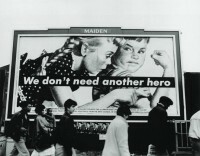 She is known for incorporating text slogans onto black and white photographs, many of which address issues of feminism, control, and consumerism. Since 1974, Kruger has had 48 solo exhibitions in galleries. She is currently a professor of art at UCLA. Barbara Kruger was published by Rizzoli New York in April 2010. It was written by Kruger and features contributions by Miwon Kwon, Martha Gever, and Carol Squiers and an introduction by Hal Foster. The book explores Kruger's work over the past 30 years, including some previously unpublished works.